Johnson, Victor C. Age 82, passed away on September 22nd. Preceded in death by his loving wife, Margaret "Maggie" (Koucky); and parents Muriel and Carl. Survived by 5 children, Vicki, David (Cindy), Stephen (Kathy), Leslie (Terrill) Anderson, and Thomas (Renee); Ten grandchildren, Hailey (Nic) Trombley, Andrew (Tori), Carter, Lauren, Mitchell, Shelby, Ben and Sam Anderson, Alex, Logan, and two fur-babies. During his career, he was a successful attorney and founding partner at Fitch and Johnson, specializing in workers' compensation. 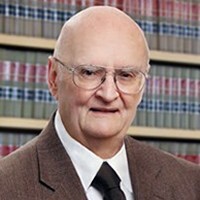 Vic actively practiced law for over five decades. He was a University of Minnesota graduate (BA, JD) and served in the US Navy for 8 years reaching the rank of Petty Officer. Vic worked hard to build a good life for his family. He was a loving husband, father, and grandfather, who did everything and anything he could for family and friends. He was an amazing man and we miss him tremendously. A memorial celebration will be held Oct 5th, 2 PM- at Portland Ave United Methodist Church, 8000 Portland Ave S., Bloomington, MN, 55420, 952.888.6070. Memorials preferred to Mid-Minnesota Legal Aid, of Minneapolis. Private interment service will be held for immediate family.